I've been a fan of Mazda's MX-5 since its launch almost ten years ago. It is a car which strongly appeals to my nature thanks to its parking-friendly petite size, good looks and unshakable ability to dish out a huge helping of fun. Oh, and the flexibility to drop the top on a warm day is an enticing feature, too. But best of all, it's a hoot to drive. That rear wheel drive chassis is so rewarding when you put it through its paces that it manages to make every mile thoroughly enjoyable, leaving drivers of all ages and abilities feeling elated. Even my mother, who drives very cautiously, loved her trip behind the wheel of the Mazda MX-5. In the early 1990s it was the car that rejuvenated the small sports car market, causing other manufacturers to wake up, take notice and create their own version of it. 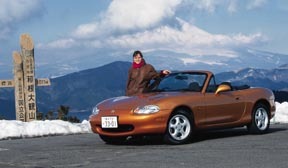 Eventually, the Mazda was joined by competition in the shape of Fiat's Barchetta, Rover's MGF and BMW's Z3. After nearly a decade of producing one of the most sought-after sports cars, Mazda realised a redesign was in order if the MX-5 was to maintain its grip on this motoring domain. So the 1998 model was created. The overall dimensions of the original car were retained because, quite simply, it sold so many. It is still instantly recognisable as an MX-5 though there are some notable differences. The most obvious is the absence of pop-up headlamps. Fans of these distinctive lights should dig out a black arm band, for they no longer sit astride the car's nose. Instead, the Mazda design team opted for more traditional fixed lights, chosen to aid aerodynamics - and therefore fuel consumption - and to give the car a new, sleeker look. The back bumper has grown in depth this time around, though the integrated rear mud guards don't make an appearance on the new model and neither do the rather charming finger-size door handles which added to the car's character - these were left off in the design studio because people sometimes broke their nails when opening the door. They should keep them trimmed, I say. Anyway, the new exterior look is still appealing, particularly when topped off with a set of alloy wheels which will be a standard-fit on the top-notch version. The two lesser-equipped models have steel wheels fitted as standard though dealerships will stock a vast array of after-market alloys for that individual touch. Mazda is 78 years old this year which coincides with the creation of a new corporate logo. It rests on the nose of the latest generation MX-5 and will be seen on all of Mazda's future vehicles. Moving inside, the two-seater's cabin has been brought up to date with the use of more tactile materials and a curvaceous dashboard. The old-style sliding heater controls have been superseded by dials, and the door pockets are more practical than the previous elasticated ones, offering more room to hold bits and bobs. Although the previous interior was stylish in its simplicity, the all-new model is more appealing and cosy and occupants sit in snugly supportive seats. A unique feature on this class of car is the redesigned rear glass window which is integrated into the hood providing improved visibility and demisting for added safety. This improvement should put an end to those scuffed knuckles which went hand-in-hand with zipping up the old plastic screen into the roof. It still only takes half a minute to whop the hood down - which can be done from the driving seat (great for lazy people like me) and the small tonneau cover slides and clips into place, securing it all. A small wind blocker makes its debut appearance here too, deflecting wind away from the occupants when flipped up into place behind the seats. It helps stop long hair whipping up and stinging your face, which is a real bonus, though it's only fitted to the MX-5 1.8 and 1.8iS. The three-model line-up will be badged as before, though each one has similar storage spaces. There's a small shelf behind the seats to rest items, and a boot that's been enlarged thanks to the spare wheel which now sits under the trunk rather than in it. There's room for a suitcase in there, but of course an empty passenger seat can take more, too. The car goes on sale in the UK in late April, but Mazda kindly took a group of motoring journalists to the MX-5's homeland of Japan, and allowed us to drive on the road and around the manufacturer's demanding Miyoshi proving ground, near Hiroshima. It was a great place to see what the car was capable of, with every type of corner cropping up somewhere around the long, undulating circuit. If you think the new Mazda MX-5 sounds enticing when standing still, wait until it turns a wheel. Under the bonnet lie the same 1.6-litre 16v and 1.8-litre 16v engines as before, but both have been modified to boost performance. The 1.6-litre is 20bhp better off now with a total of 110bhp, and the larger unit has seen a hike of 8bhp taking the maximum power output to 140bhp. The extra grunt has improved the 0-62mph times of both engines by almost a second, with the 1.6 taking 9.7 seconds and the 1.8 just 8.0 seconds. The speedometer needle also reaches numbers it never did before, achieving top speeds of 119mph and 127mph respectively. Give it some wellie and the car sets off with admirable enthusiasm. The engines' extra power is noticeable all the way up to the red line. The excellent throttle response - a feature that was admired in the original car - is still strongly in evidence, giving it a pleasurably sporting feel. The two engines are mated to a five speed gearbox which has been modified from the old version to make the changes smoother. The short lever slips into each gear even more eagerly than before, though maintaining that fast, wrist-flicking action when engaging. But it's the handling which has improved the most - surprising because the original car was so good anyway. The steering, power assisted across the range, is nicely weighted at all speeds and has a constant flow of feedback from the front tyres which encourages drivers of all abilities to extract everything from the car. In true sportscar fashion the MX-5 feeds its power to the rear wheels and, with an even weight distribution between the front and rear ends, the Mazda corners with superb stability. It's an agile little thing too, as it showed on the tight, twisty, and seemingly never ending series of turns on the back section of the Japanese track. As long as you don't lift off the throttle mid way through a bend, its rear end won't step out of line in that traditional rear-wheel-drive fashion. Though if you enjoy a bit of back end movement, it won't let you down if induced. The car's ride is smoother thanks to suspension alterations which have resulted in a greater compromise between comfort and a racy feel. This was surprisingly noticeable when driving the old and new models around the track back to back - I say surprising because you would think the original couldn't be bettered. But it certainly has been. It is more powerful and even better to drive than before, and whizzing round the circuit with the hood down and the sun shining was such an excellent experience. It's fantastic how much fun can be had from such a small package.